Sugar gliders are small gliding marsupials and are only rarely found with private animal keepers in Germany. However, you can frequently see these comical and social animals around the world in zoos and animal parks. In recent years, their popularity here in the U.S. has grown considerably. 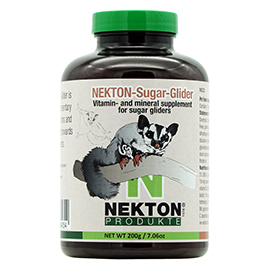 NEKTON-Sugar Glider is a special supplementary feed rich in vitamins and minerals aligned towards this animal's needs. It is important to pay attention to a balanced diet. That can turn out to be difficult, as sugar gliders can be very selective. They tend to develop a liking towards their favorite food. This can vary from day to day, with everything else then being ignored. Then all your efforts to supply your sugar glider with a balanced diet can be in vain and your choice of important nutritional supplements becomes guesswork. This is why NEKTON has developed a supplementary feed for sugar gliders. Contains 18 amino acids. 10 g (1 level measuring spoon) in 100 ml of lukewarm water, stirring to dissolve. Use it 2-3 times a week as a supplement. Storage: NEKTON-Sugar Glider should be stored dry and out of sunlight, between 15° and 25° C.
DO NOT STORE IN THE FRIDGE !!! Recommendation: Disinfect drinking vessels and food containers daily with NEKTON-Desi-Plus to guarantee hygienic and clean feed!